Eighteen summers is all we get. And the seasoned parent will tell you those last few summers? They look altogether different as jobs, sports, clubs, youth group and school pull our kids away from home and family more and more. “When did you first start feeling how fast time was going with your kids?” a friend asked the other day, both our girls now in college. The days of childhood rush past and there are only so many lessons we can teach. 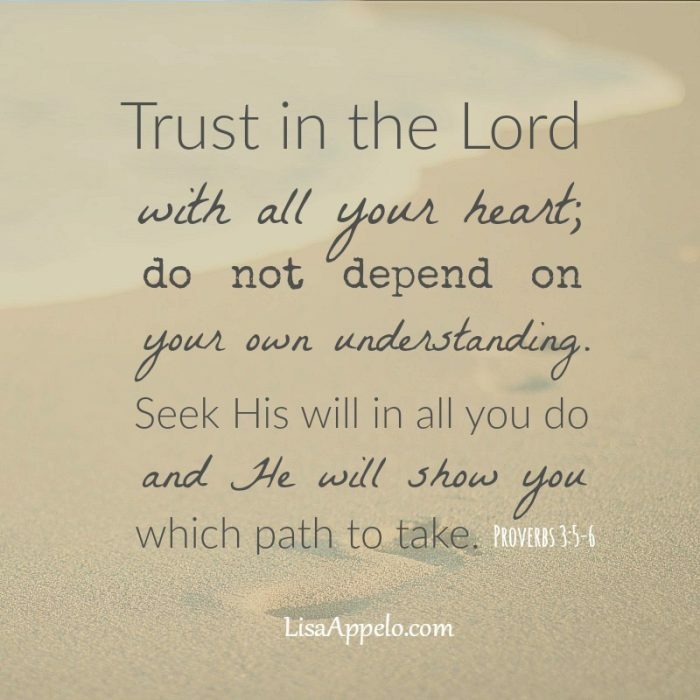 But here’s what I’ve learned: while there may be lessons I regret teaching and things I didn’t even know my kids needed, one thing eclipses all of it: the very words of God. And today’s the perfect day to get a plan and push go. Be the woman who gets God’s word down to her very bones. Be the mom who learns with her kids. Be the grandparent who challenges her grandkids. But how to memorize scripture? 2. Start young. We so underestimate our kids! Chances are your child is already memorizing Disney’s latest ballad so why not turn him to scripture? I started memorizing with my kids so even the babies and toddlers were listening to the words and cadence as the olders worked through passages. As they grew, they joined as they were able and by 3 and 4 years old, they were memorizing scripture along with us. 3. Use hand motions. Hand motions are an incredible way to nail down scripture. We’ve used American sign language but also make up hand motions for key words and phrases to prick our memory as we move through a chunk of scripture. This site lets you plug in words and gives a video for the corresponding sign. 4. Sing the scriptures. If you can still recall songs from a childhood musical, you know music helps store memory work forever. Put words to your own melody like my fun friend and her daughter here. Or digitally download scripture songs like these from Seeds Family. 5. Use an app. If you love all things tech, an app can help you memorize scripture. One of the most popular is Scripture Typer, a free app that helps you memorize verses through recordings, illustrations and interactive exercises. 6. Write it out. Write verses on index cards and put them where they’ll be seen: on your bathroom mirror, computer screen, above the kitchen sink or carry them with you as you walk or exercise. You can also have children copy the verses (hello, handwriting practice!). 7. Record your words. Record the scriptures you’re memorizing to play back while you’re in the kitchen or while kids are building with legos. Listening to these recordings in the car is a great way to use commute time! 8. Review often. This is key. We usually add one verse a day, and once that’s memorized we recite from the beginning to the point we’ve memorized. 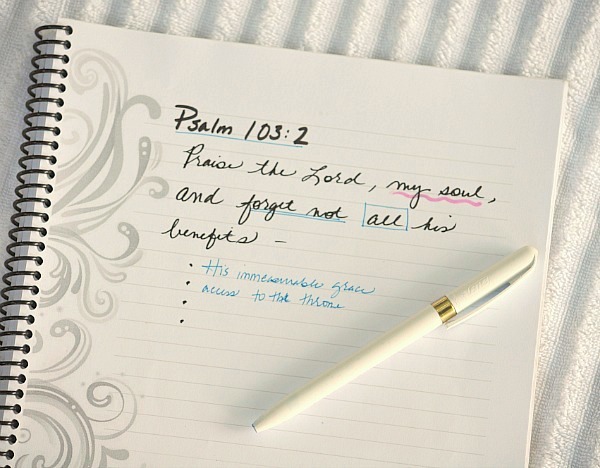 Even you finish a chunk or chapter, put the scripture into a rotation where you review it on a monthly basis. 9. Play Round Robin. One of the review games we play is to go around the room and have each person recite one verse. Do it again, starting with a different person so that each person recites a different verse each time. 10. Reward your work. Time to celebrate your hard work! This is a huge incentive and commendation for kids. We had a treat bag with cheap goodies that was a hit for my kids. Your celebration might be an outing for shaved ice or a reward of privileges. If you’re a grandparent, uncle or aunt, coach or mentor, consider this amazing experience a friend shared: An older Sunday school teacher offered to give her children a dollar for each verse they recited by heart. Little by little, her boys learned James, reciting each chapter as it was memorized. Even after the teacher moved, her boys continued to call monthly and recite their learned verses. By high school graduation, each son had memorized the book of Proverbs, reciting it one chapter at a time. Even better, each boy had developed a relationship with a godly mentor who’d encouraged and rewarded their hard work. If you’d like encouragement delivered right to your inbox, subscribe here and I’d love to send you my FREE 100 Days with Christ Bible study and journal. this is beautiful. I am a Sunday school teacher and these are good tips. they are focusing on memory verses and bible study methods for the teens. I so appreciate when a church family encourages scripture memory. Thank you for sharing. love this, Lisa Appelo! may many families embark on this wonderful experience. God’s word never returns void! Thank you Terissa for sharing this. It is in both Android and Apple. Wow, I haven’t heard of that one. Thank you for sharing it! I just found this via Pinterest and had to tell you what an awesome encouragement this is to me. Like I was almost crying reading your post because it hit my heart right where it needed to be hit! Even though we read a lot from the Bible, God has really put on my heart recently to start memorizing scripture. I am a first-gen Christian (Almost 4 years old!) and I really didn’t know where to start this journey or how to go about it. I’ve downloaded the Scripture typer and I LOVE the bag of small rewards idea. My kids don’t get a lot of “extras” due to money struggles right now so I think that will be really special. Thank you so much for such a helpful post! Sarah, this is awesome! You will be so blessed by starting this with your family! 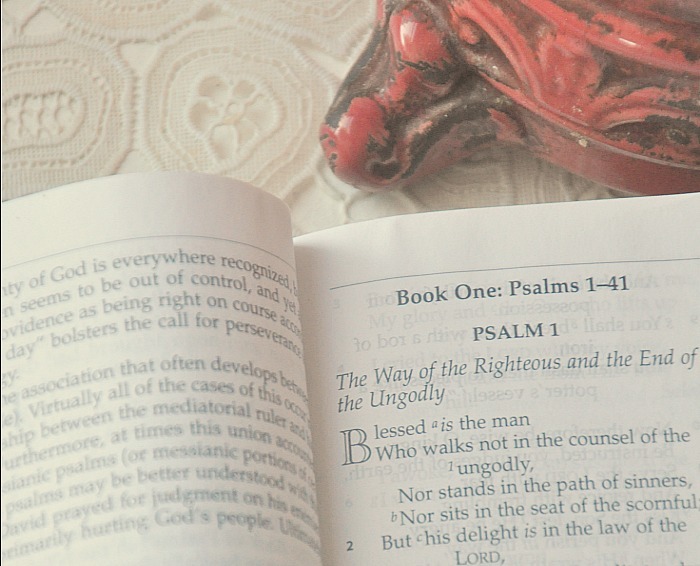 If God doesn’t lead you elsewhere, you could start with Psalm 23 and Psalm 1. Those are great foundations. I’m going to be doing a follow-up post with the portions of Scripture we’ve memorized and some helps. Also, for rewards, sometimes my kids’ favorite rewards are privileges. You could also print out certificates for little cost. Many blessings to you. Thanks for a great post – I especially appreciate the recommendation for the Seeds Family music : ) I looked them up on youtube, and am enjoying them right now. My daughter loves learning Scripture (and everything else) to music – so this will be a great addition! Anna, Seeds Family worship is a recent find for me as well. Glad you’re enjoying it! These are wonderful tips. I try to keep a memory chapter going most all the time; it’s a great way to redirect any anxious thoughts when they pop up (especially middle of the night ones!). I’ll share this on Facebook with our “Hide His Word” group. So right, Lisa. 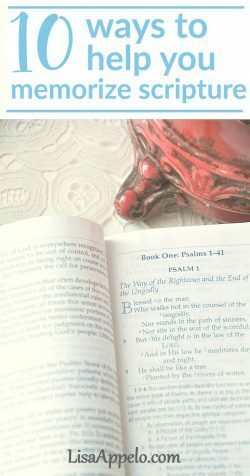 I cannot tell you how many mornings I’ve woken up to the words of Psalm 139 — I think the first scripture I learned after Psalm 23. Scripture is such a cure for anxiety! Lisa, this is such a good post. I appreciate the encouragement and helpful tips. And WHAT a precious story about the Sunday school teacher/mentor! Definitely sharing on Facebook today, and pinning too! Yes, Betsy, he’s been an inspiration of how to motivate kids to learn scripture. Wonderful advice, Lisa. I’m glad I had to memorize scripture as a schoolgirl, because it sticks with me now, decades later. Sharing this on FB and Twitter! I wish I’d started earlier! But it’s never too late. Thanks, Sarah! Loved this, Lisa. Shared! Such great ideas for kids and for me. 🙂 I know the Scripture I’ve already committed to memory brings me peace, helps overcome the enemy, and gives wisdom. Thank you for this post. Blessings! Yes! I wanted it for my kids, but wow have I been blessed by years of memory work. Thanks for this! I really needed the reminder of how important, and that my 4 year old is big enough to memorize with me! I used to put a verse on the dry erase board in the lunchroom at work (church secretary) and then erase a few words per day. This worked well for me to memorize. Need to put up a board here at home now! Thanks for the tips! We love using Seeds Family Worship songs. Great for the kids (and for us!). Yes, Seeds is a recent discovery for me. Thanks Shannon! Love it! The kids learn scripture at school, but now that summer’s out I find myself “letting everything go.” Might be time to dig in God’s word and deposit a few scriptures with them. It *is* hard when summer has no consistent rhythm. But getting it through the school year is huge.